UCIL Notification is out. UCIL is recruiting for 17 Executive Director Post Posts. You can check UCIL - Uranium Corporation of India last date, download UCIL notification, visit UCIL official website and check other UCIL Vacancy details.Complete Vacancy and recruitment Details about 17 Executive Director Post vacancies in UCIL are provided below by JobSarkari.Com only for you. Last Date of Receipt Application. 18/08/2018. SC/ST/PWD And Female Candidates. No Fee. Executive Director. 01. 00. 00. 00. 01. General Manager. 01. 00. 00. 00. 01. DGM. 01. 00. 00. 00. 01. Chief Superintendent (Mines). 01. 01. 01. 00. 03. Chief Superintendent (Mill). 02. 00. 01. 00. 03. Manager (Personnel). 01. 01. 00. 00. 02. Manager (Accounts). 00. 00. 01. 00. 01. Superintendent. 01. 00. 00. 00. 01. Addl Superintendent (Env Engineer). 01. 00. 00. 00. 01. Addl Superintendent (Civil). 01. 01. 00. 01. 03. Total Vacancy. 10. 03. 03. 01. 17. Executive Director. Candidate Must Have Passed Bachelor Degree in Mining Engineering And Having Mines Manger Certificate of Competency of First Class And Having 23 Years Post Qualification Experience in Production Line And Having Knowledge of Computer. Max 53 Years. General Manager. Candidate Must Have Passed Bachelor Degree in Mining Engineering And Having Mines Manger Certificate of Competency of First Class And Having 20 Years Post Qualification Experience in Production Line And Having Knowledge of Computer. Max 50 Years. DGM. Candidate Having Degree in LAW And Having 18 or 12 Years Post Qualification Experience in Dealing With Legal Matters. Max 48 Years or 40 Years. Chief Superintendent (Mines). Candidate Having Degree in Mining Engineering And Having 15 or 12 or 09 Years Post Qualification Experience in the Production Line And Having Knowledge of Computer. Max 45 Years or 40 Years or 35 Years. Chief Superintendent (Mill). Candidate Having Degree in Chemical Engineering/ Metallurgical Engineering/ M. Sc. in Mineral Processing And Having 15 Years or 12 Years or 09 Years Post Qualification Experience in Hydro Metallurgical/ Mineral Processing Plant. Max 45 Years or 40 Years or 35 Years. Manager (Personnel). Candidate Must Have Passed Any Degree in Engineering And Having 2 Years Full Time PG Degree/ Diploma in Personnel Management, Labour/ Social Welfare. Having MBA With Specialization in Personnel Management. Having MBA/PGDM in HRD And Having 12 Years And 09 Years Post Qualification Experience As Mentioned in Notification. Max 40 Years or 35 Years. Manager (Accounts). Candidate Having CA or ICWA or MBA Finanace And Having 12 Years or 09 Years Post Qualification Experience in Accounts Department. Max 40 Years or 35 Years. Superintendent. Candidate Must Have Passed PG Degree in Geology/ Applied Geology And Having 12 Years or 09 Years Post Qualification Experience in Interpretation of Surface Exploration Data As Mentioned in Notification. Max 40 Years or 35 Years. Addl Superintendent (Env Engineer). Candidate Having Degree in Environmental Engineering. Having In Any Other Branch of Engineering. Having Ph.D in Organic/ Inorganic Chemistry Backed With PG Dipoma or Full Time Certificate And Having 09 Years or 06 Years Post Qualification Experience in Environment Management As Mentioned in Notification. Max 35 Years or 30 Years. Addl Superintendent (Civil). Candidate Having Degree in Civil Engineering or Equivalent or Having 09 Years or 06 Years Post Qualification Experience in Structural Designing of Industrial Buildings. Max 35 Years or 30 Years. 2. Candidate Need to Download Application form As Given our Website. 4. Candidate Are Required to Attach All the Mandatory Documents Like Cast Certificate, Mark Sheet And Passport Size Photos With Application Form. 5. Candidate Need to Send the Application Form on Given Address Before 18th August 2018. Q. 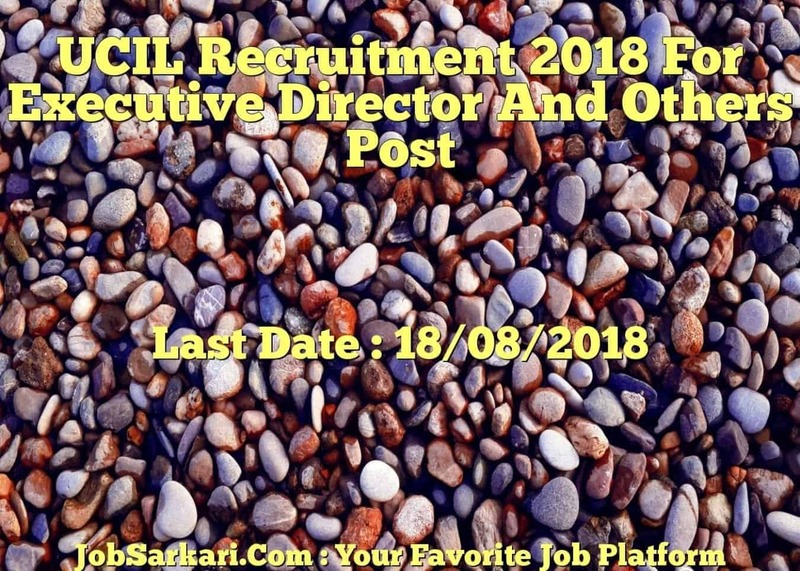 What is the Last Date For UCIL Executive Director Post Vacancy ? A. 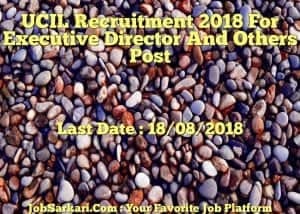 Last Date for UCIL Executive Director Post Posts is 18/08/2018. Q. What is the Form Type of UCIL Executive Director Post Recruitment ? A. The Form Type for UCIL Executive Director Post Posts is Offline. Q. How many vacancies are available in Uranium Corporation of India Executive Director Post Posts ? A. There are about 20 Vacancies in Uranium Corporation of India Executive Director Post Posts. Q. What is the Full Form of UCIL ? A. Full Form of UCIL is Uranium Corporation of India .